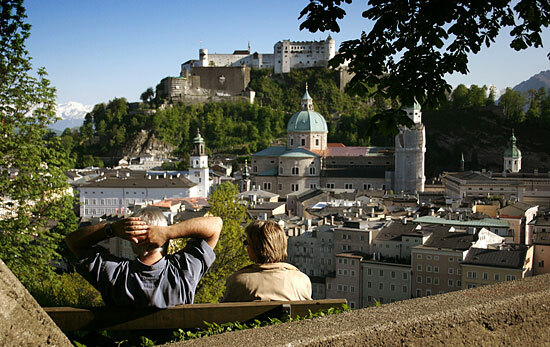 A couple enjoys the view on the Altstadt of Salzberg: The castle Hohensalzburg Fortress, the Dom Cathedral and the mix of Medieval and Baroque buildings in combination with stunning Alpine scenery. This view is best enjoyed along the Basteiweg on Mount Kapuzinerberg, which follows the Baroque ensemble of Salzberg′s core. The path can be a bit dangerous, but just underneath the Capuchin′s Abbey (Kapuzinerkloster), there is a platform with a viewpoint that is within safe and easy reach from the Linzergasse or Steingasse. Easy to climb over stairs, yet one of Salzberg′s most scenic spots.